Child Care Quality is the most consistent finding of studies linking child care to children’s development. Our high-quality care includes all key ingredients, integrated with the British EYFS (Early Years Foundation Stage) curriculum, setting standards for the learning, development and care of your child from birth to 6 years old. Little ones feel safe, secure and happy in our soft, inviting pre-nursery 1 room, where warm caring caregivers and experienced British nurses bond and develop trust with the children. Development begins from birth, making every moment precious. Our Pre-Nursery 2, provides an early education experience that gives every child a head start in kindergarten and beyond for a love for learning to last a life time. We give our busy toddlers plenty of room to move and explore, providing nurturing guidance as they develop physical skills and master emerging milestones. We offer opportunities for our nursery children to explore their growing individuality, fostering independence, communication skills, hands-on learning, literacy and number concepts. Engaging and nurturing, our classrooms are designed as a learning community for your child. Our British EYFS curriculum ensures your child’s development and progress are carefully captured and are in line with latest research. Focusing on your child’s learning goals, every step of the way. In line with The British EYFS and Key Stage 1, we provide children in our setting with the balance of child-initiated play, focused and structured learning to ensure that they enjoy learning to read, write, use numbers, think mathematically, explore their world and make creations. Following multi-step instructions, finding multiple ways to solve problems, organising work, controlling impulses and sustaining attention become the focus of the developing curriculum of the kindergarten child. Immersed in becoming familiar with the format and structure of a kindergarten school day, while developing critical skills to succeed in primary school. 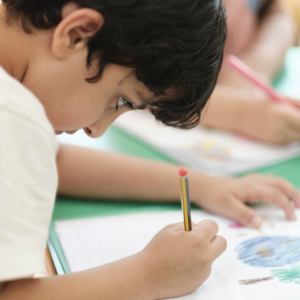 British Curriculum Early Years goals are targeted, with kindergarten-level instruction in reading, writing, and maths. As we progress towards Key Stage 1, the culmination of our school readiness programme engages individual attention towards development goals, independent reading and writing to communicate ideas. Bringing together all the lessons and skills of your child’s journey in a programme designed to best prepare them for success throughout their academic life. Bigger classrooms, captivating playground features, technological upgrades and a revised British curriculum are all in place to make sure your children receive an international standard of education. Our extensive new campus in Jary Al Shaikh offers amazing new facilities, all designed to European standards. Click on the pin below to find directions. Whether your child is a native speaker or an expatriate looking for a marvellous opportunity to learn and be involved with Bahrain’s culture, we are indeed a caring and professional beginning to their bilingual future.